Future Air operates the largest fleet of Cessna 172 aircraft in the Georgian Bay region. With this common fleet of aircraft it allows us to move aircraft from base to base without interrupting anyone's scheduled flight time. The Cessna 172 was first flown in 1955 and is still in production; more Cessna 172s have been built than any other aircraft. The first production models were delivered in 1956. As of 2008, more than 43,000 had been built. In Comparing the Cessna 172 to other single engine trainers the C172 is more comfortable and forgiving, making it an ideal aircraft to learn how to fly, to view the majesty of the Earth and to rent for fun or business. 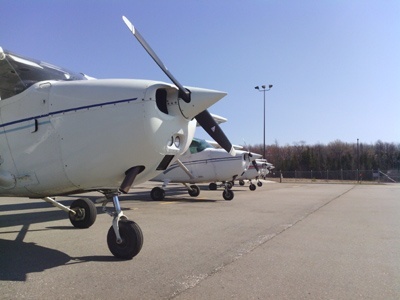 Future Air bases Four Cessna 172s at our Barrie Lake Simcoe Base and Two Cessna 172 at the Collingwood base. With multiple aircraft located at each base there is never a concern with wait times or lack of availability. Our aircraft are maintained to the highest standards. 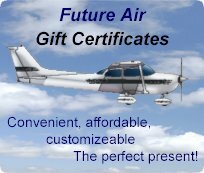 These excellent flexible aircraft allow for not only Training, but Sightseeing and Aircraft Rental as well.